Thirteen years after hurricanes Katrina and Rita devastated the Gulf Coast, American Baptist Home Mission Societies continues to assist rebuilding efforts in New Orleans. And we will continue to do so for as long as necessary. In 2019, American Baptist college, university and seminary students are welcome to join us in New Orleans July 27-Aug. 3, while all other American Baptist volunteers are welcome July 28-Aug. 3. Come to worship, witness and work, as we help New Orleans residents rebuild their homes, churches, communities and lives. The Rev. Jesus Garcia, pastor of Iglesias Bautista de Metropolis, Carolina, Puerto Rico, talks to his team of volunteers onsite at Love in Action Outreach, New Orleans. This is the third year that church members have traveled from Puerto Rico to participate in “Home Mission: ‘Til the Work is Done.” Approximately 15 of Garcia’s 29 volunteers helped at Love in Action, where they stocked the food pantry’s shelves and helped clients with their monthly shopping. For her first time in New Orleans for “Home Mission: ‘Til the Work is Done,” Blanca Rodriguez, 54, of Iglesia Bautista de Metropolis, Carolina, Puerto Rico, helped at Love in Action outreach. “Our church’s theme,” she says, is “We enter to worship, and we go out to serve [“Entramos para adorar; salimos para servir”]. Armando Martinez (at right), 23, of Iglesia Bautista de Metropolis, Carolina, Puerto Rico, helps clients choose produce at Love in Action outreach food pantry, New Orleans. “I like to help people,” he says. The Rev. Dr. Kathy Pickett, pastor of Prairie Baptist Church, Prairie Village, Kan., paints a porch railing at the home of Delores Napoleon. Rachel Pruett, 17, was among the youth from Prairie Baptist Church who volunteered at the home of Delores Napoleon. Although this mission trip is not Pruett’s first, it is her first time in New Orleans, she said. A small group engages in prayer prior to the opening of day four of the seven-day “Home Mission: ‘Til the Work is Done” in New Orleans. Approximately 185 American Baptists from churches across the United States—Maine to Puerto Rico and California to New York—are participating in “Home Mission: ’Til the Work is Done” this week in New Orleans. Vithem Rumthao, 13, of New Life Christian Fellowship, Castro Valley, Calif., grooms a horse at Rescue Ranch, Belle Chasse, La. Rumthao is on her first mission trip as part of “Youthquake,” a cooperative youth program among American Baptist churches in California. 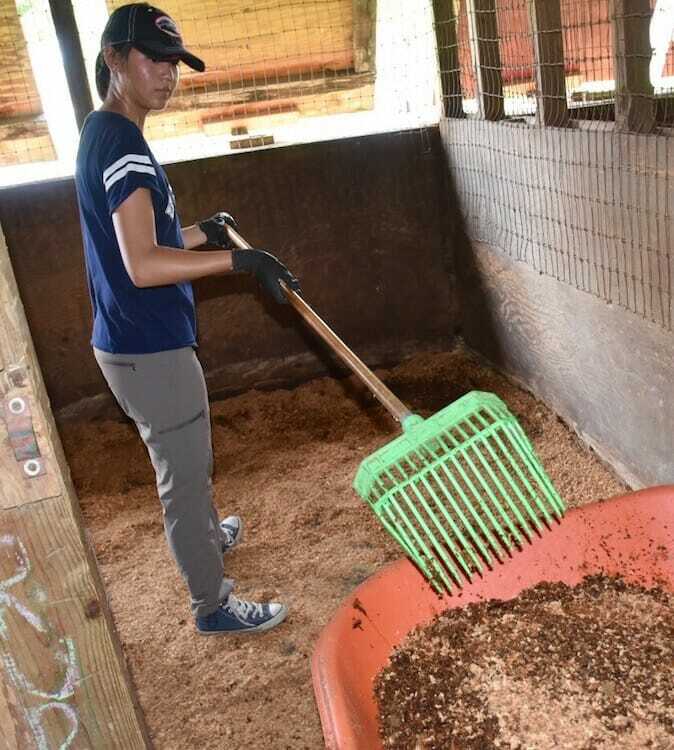 A Youthquake volunteer cleans a stall at Rescue Ranch. George Richardson of First Baptist Church, Chicago, paints the foyer of the nearly 100-year-old home of Elise and Julian Hamilton. A volunteer measures wood for work at the abandoned building behind Burnell Colton’s variety store. Colton plans to turn the building into an Internet café for youth because a high school is opening nearby in the Lower 9th Ward for the first time since the 2005 hurricanes. Youthquake members from four California churches visit the Claiborne Avenue Hurricane Katrina Memorial, New Orleans. Volunteers offered manicures to members of one of three senior citizens day programs that meets at Camp Restore, New Orleans. Here, Mia Neaderhiser, 15, of Prairie Baptist Church, provides a manicure to Lottie Marco, 64, of New Orleans, who attends twice weekly. “I feel great—special,” says Marco of the nail treatment. Marco chose polish that matches a shade of purple in her shirt. For more information, contact Victoria Goff at [email protected] or 610.768.2449.